Long-term readers (ahem) with powers of recall like Rainman will doubtless remember an off-the-cuff remark from Jan 2001 about an old Saturday job, plus a follow-up reference from a trip to Wyevale. That was me, back in I Heart 1982, clearing the tables, loading the dishwasher and -- can you believe it? 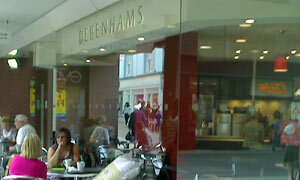 -- emptying the ashtrays in Springles, the restaurant upstairs in Debenhams, Ipswich. Merest hint of a dog-end and whoosh, I'm back there in an instant. Skipping the nineties and noughties, I am returned like the conquering hero to the same ex-Footmans department store. Not even sure if there remains an eatery on the top floor, 'cos today I'm grounded. Into the leftmost entrance, commando crawl past the Venture portrait people and grab a tray. Savoury options closely resemble a Costa or a Starbucks. Unlike BHS last week, there's no hot food sitting around though I spy a questionable prawn salad. Guess it'll be a panini -- would you like that heated? -- plus small bag of kettle chips and a bottle of This Water. That'll be £7.17, please. You what?! Four quid panini, one quid crisps and over two quid for the drink. Like being in flippin' Cineworld. And could I have a glass for my liquid gold? Certainly sir, she says, handing me a plastic beaker. Lots of outside seating for ladies and gents who like to light up with a light lunch. Can still watch the world go by from an inside table. Here's panini, limp and lava-hot. Fetch your own cutlery, it seems. I dunno, fings ain't wot they used to be. Bits of cake are passing the time of day with no cover. Pre-packed caramel slice will have to do, with an Americano -- pleased to see that "all our coffee has two shots". Demolishing the slice, I catch sight of Evans, the plus size outfitters, out of the corner of my fat lazy eye. If it was a car -- Fiat Doblo. If they were passing by -- Ann Widdecombe.